Issue 145 of The 'Shroom has been released. Give it a read! Donkey Kong Country 2: Diddy's Kong Quest is the second Donkey Kong Country game for the SNES. It is the sequel of Donkey Kong Country and stars Diddy Kong, as he and his partner, Dixie Kong, make their way through Crocodile Isle to save Donkey Kong from the Kremling Krew. In 2004, a remake of the game was made for the Game Boy Advance. It features several differences, including the addition of photographs and extra DK Coins. It also just refers to the game as Donkey Kong Country 2 by omitting Diddy's Kong Quest. Later in 2007, the game was released on the Virtual Console to play on the Wii system. This release was delisted for unknown reasons until it was re-released again in Europe and Australia on October 30, 2014. It was also released on the Wii U Virtual Console in Europe and Australia in late October 2014, and in the US and Canada in late February 2015. On handhelds, it was released exclusively for the New Nintendo 3DS Virtual Console in 2016. Donkey Kong Country 2: Diddy's Kong Quest is the sixth best-selling Super Nintendo Entertainment System game, with its predecessor being the third. The game has a Game Boy pseudo-sequel, Donkey Kong Land 2, that was released one year after the original. The Mushroom World Encyclopedia is a multilingual and open-content project which includes the independent encyclopedias covering the Mario franchise from different areas of the world. On April 15, 2019, Doug Bowser (pictured) replaced Reggie Fils-Aimé as the president of Nintendo of America. Super Mario Bros.: The Lost Levels was made available on Nintendo Entertainment System - Nintendo Switch Online on April 10, 2019. A free update for Super Mario Odyssey, which adds mini-missions for the Toy-Con VR Kit, is set to release on April 25, 2019. Arcade Archives: Donkey Kong 3 was released worldwide for the Nintendo Switch's eShop on April 5, 2019. 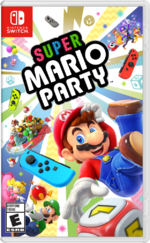 Super Mario Party (pictured) is the first Mario Party game since the fifth installment (seventh in Japan) where the announcer is female. Yoshi's Crafted World is the first Yoshi game with Burts to not feature them as a boss of World 1. Busted Bayou from Donkey Kong Country: Tropical Freeze shares the same Japanese name as Web Woods from Donkey Kong Country 2: Diddy's Kong Quest. Because the game is fully voiced for all regions, WarioWare Gold marks the first game since Mario Kart: Super Circuit where Wario is voiced by someone other than Charles Martinet (although he reprises his role for the English localization), and the first game since Mario Kart 64 to give him different voice actors for different international markets. This page was last edited on April 20, 2019, at 11:45.